In percussion, Cymbal Choke is a drum stroke which consists of striking a cymbal with a drum stick held in one hand and then immediately grabbing the cymbal with another hand, or more rarely, with the same hand. The cymbal choke produces a burst of sound which is abruptly silenced, which can be used for punctuation or dramatic fortissimo effects. 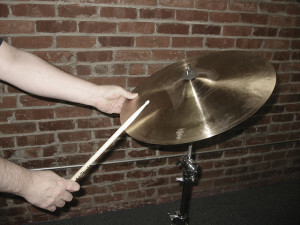 In some modern music, namely Heavy Metal, it is “often employed to emphasize a particular beat or signal an abrupt conclusion to a passage.” Cymbal chokes are used extensively by classical percussionists to muffle the sound of a cymbal in accordance with the composer’s notation, or in an attempt to match the sustain of other instruments in the ensemble.